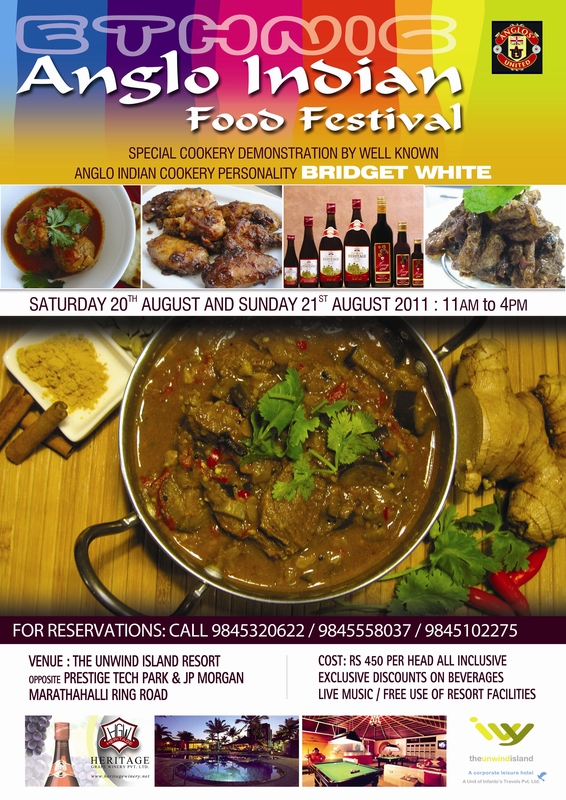 A Food Festival featuring and showcasing Ethnic Anglo Indian Cuisine is being held at the Ivy Unwind Resort on the 20th and 21st August 2011 during the Lunch Hours. The Food Festival featuring ethnic and traditional Anglo Indian dishes will highlight the unique Food culture of the Anglo Indian community. Conceptualized by Mrs. Bridget White-Kumar, often referred to as the expert in Anglo Indian cuisine, the Food Festival aims to give the diners an exemplary dining experience. From the traditional Mulligatawny to the exotic Coconut flavored rice to the rich Bread Pudding, the Food Festival is sure to satisfy many a palate. “Anglo-Indian Cuisine is a fusion of both western and Indian Cuisine and is perhaps the first examples of FUSION FOOD in the world. 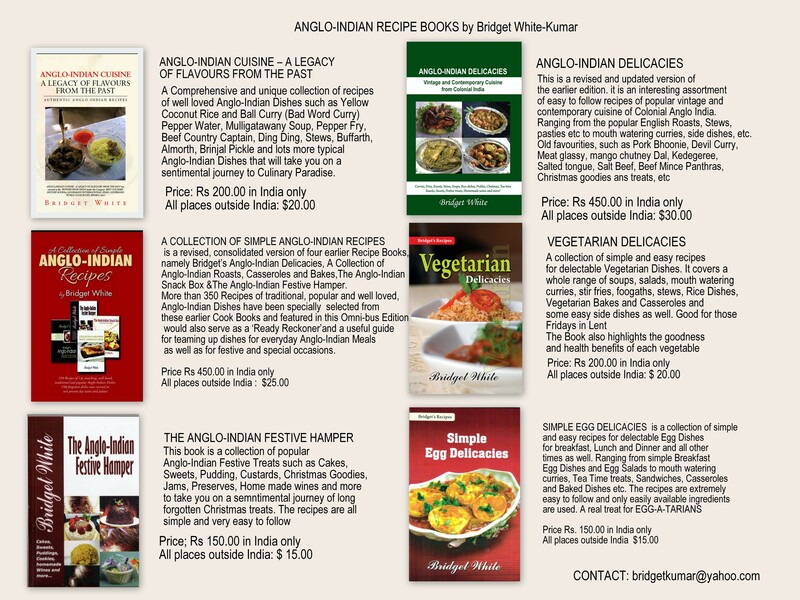 As most Anglo-Indian dishes derive from the traditional British cuisine, by the addition of Indian spices and condiments, the distinctive tastes and flavors of this cuisine makes it unique” explains Bridget. As wines are an integral part of the Anglo-Indian table, the Food Festival will have selected wines to accompany the mouth watering dishes on the Lunch Buffet. Mr. Raja Reddy, of Heritage Wines has highly recommended his Heritage Brand of wines, as the perfect beverage to blend with the Anglo-Indian cuisine. The wines are served on a complimentary basis at the Event. The Food Festival includes Special offers on a range of Alcoholic and Non-Alcoholic beverages and includes free use of the Resort Facilities. The Ivy Unwind Resort located on the Marathahalli Ring Road, opposite the Prestige Tech Park and JP Morgan, boasts of its unique guest facilities as well. Mr. Arun Kumar, the General Manager of the THE IVY UNDWIND ISLAND RESORT is the force behind the Anglo-Indian Food Festival. 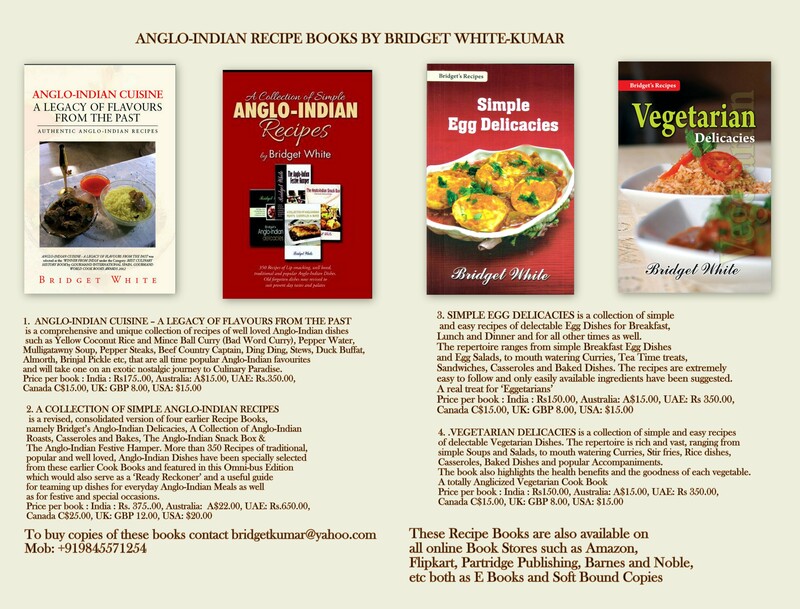 Posted on August 18, 2011 by Bridget White-KumarPosted in Anglo-Indian RecipesTagged ANGLO-INDIAN FOOD FESTIVAL.